Wolfe & Wyman LLP is a civil litigation firm that assists corporate, institutional and individual clients with legal matters throughout the states of California, Nevada, and Arizona. 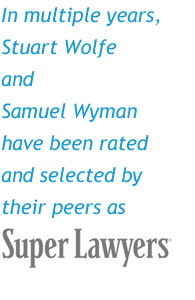 Founded in 1994 by Stuart B. Wolfe and Samuel A. Wyman, the firm develops and maintains a long-term partnership with its clients. Over 50% of the firm's work comes from clients who have been with us since our inception. All our attorneys and professional staff are dedicated to responding to client needs and have a passion for their work. 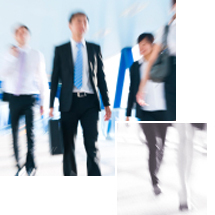 At Wolfe & Wyman LLP, we see the big picture and solve our clients' problems in an efficient and pragmatic manner. We understand our client's business and industry and that helps us get the best possible results. At times that requires creative thinking and an early settlement while other situations require vigorous advocacy to the very end. Either way, we stand ready to be accountable and deliver excellent client service.